← Is Somebody Being Conscripted? 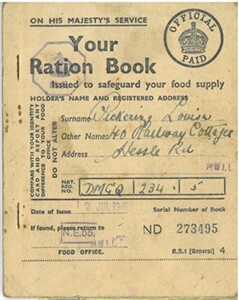 Rationing was one of the most visible daily aspects of the war, impacting everyone, including the rich. In the extreme it significantly limited food intake and options and tested the resolve and the creativity of the British people. But in the end, it worked. 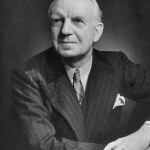 There was no starvation, no capitulation to Hitler, and the British people even ended the war healthier than they had started it, in large part due to the success of the Ministry of Food and the leadership of Lord Woolton. 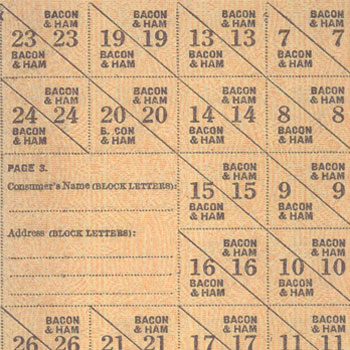 On 8 January 1940, bacon, butter and sugar were rationed. 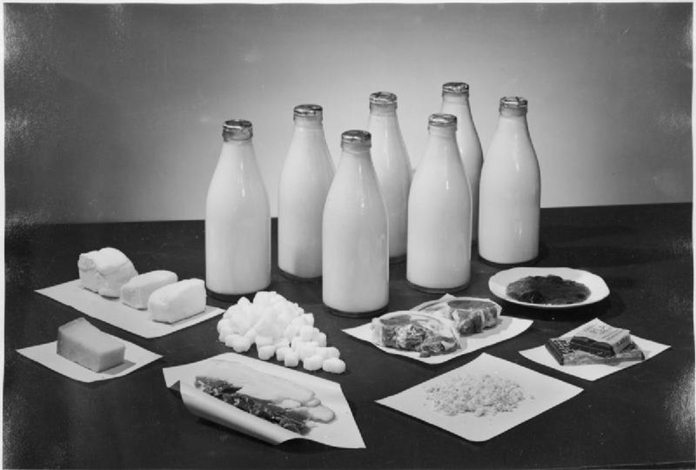 This was followed by successive ration schemes for meat, tea, jam, biscuits, breakfast cereals, cheese, eggs, lard, milk and canned and dried fruit. 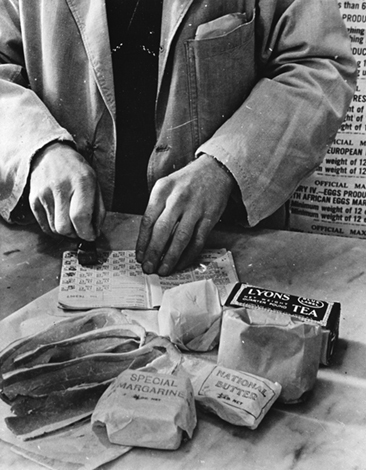 Almost all foods apart from vegetables and bread were rationed by August 1942. Fresh vegetables and fruit were not rationed but supplies were limited. Some types of imported fruit all but disappeared. 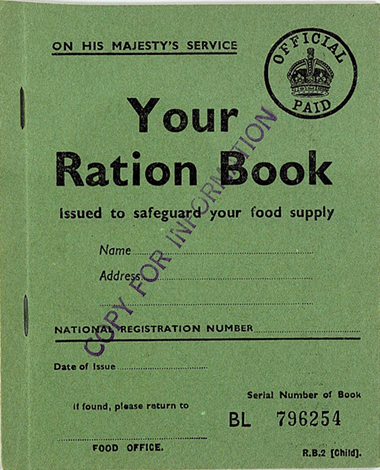 Lemons and bananas became unobtainable for most of the war; oranges continued to be sold but greengrocers customarily reserved them for children and pregnant women, who could prove their status by producing their distinctive ration books. Other domestically grown fruit such as apples still appeared from time to time, but again the sellers imposed their own restrictions so that customers were often not allowed to buy, for example, more than one apple each. Many people grew their own vegetables, greatly encouraged by the highly successful digging for victory motivational campaign. 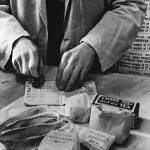 Quantities of rationed items were reduced several times, so that by the end of the war in 1945 the diet of the average Brit was barely sufficient, as well as being boring and in many cases unappetizing. Housewives almost always had wartime duties or jobs and could not invest the creativity they liked into their limited rations. Many writers of the time reported that the food situation contributed to an overall wartime feeling that the color and light had mostly gone out of the world. The most outstanding achievement of all was surely that at the end of six years of war the British people were far healthier than they had been at the beginning. 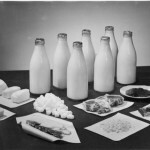 In 1939 the average housewife hardly knew a calorie from a protein; by the end of the war, to the delight, if embarrassment, of the Minister of Food, she was angrily writing to complain if her corner shop was failing to provide her families share of body-building, energy-giving and protective foods. This result reflected credit both on her and on the 15,000 employees of the Ministry of Food. The Ministry was also remarkably successful in keeping down prices. In the first world war food prices had risen by 130 per cent; in the second, which was half as long again, they rose by only 20 per cent, and even without government subsidies the increase would have been only 50 per cent. Lord Woolton’s greatest success was in winning the ordinary housewife to his side with a brilliant publicity campaign. 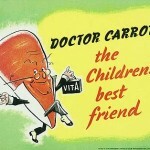 The phrase The Kitchen Front soon became universally familiar through a series of press advertisements carrying the message, ‘Food is a munition of war. Don’t waste it’, supported by Food Flashes at the cinema, short talks every morning in The Kitchen Front, after the eight o’clock news, and comic dialogues between ‘Gert and Daisy’, Elsie and Doris Waters, who often appeared with Lord Woolton on the platform. 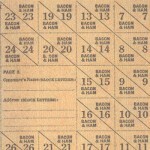 Coupon page from a ration book. 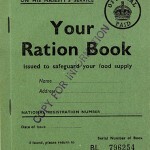 Marking the sale of food into the ration book. Weekly ration for two people. 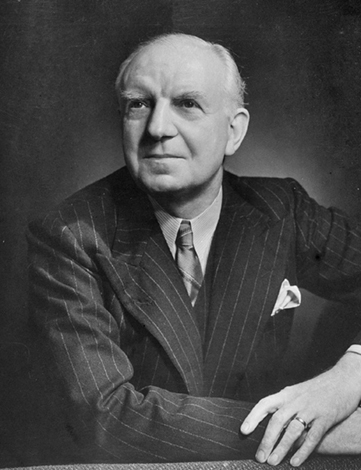 Lord Frederick Woolton, head of the Ministry of Food during the darkest part of the war. 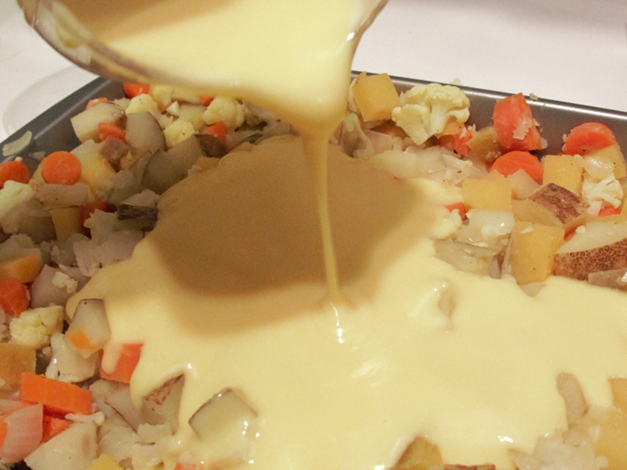 Making Lord Woolton Pie. 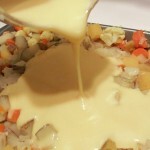 A biscuit (in the American sense) crust would go ver the white sauce. 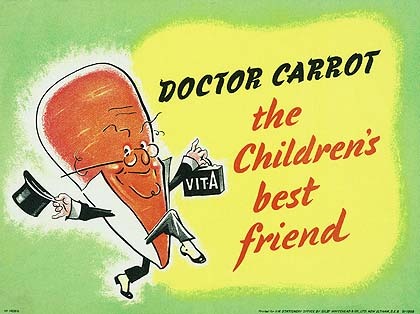 The carrot was promoted for its healthy effects, especially (if erroneously) for night vision. Fascinating how they pulled together as a people to win the war. 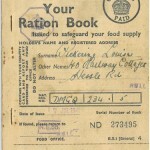 How does rationing in the US compare to in the UK?